Our MSc in Applied GIS will provide you with the mix of technical skills, practical experience and theoretical understanding to launch a successful career in the fields of GIS, applied policy research or spatial data analysis. You'll develop a wide variety of knowledge, in areas such as advanced spatial analysis, geovisualisation, policy applications of GIS in practice, and thematic mapping and cartogram creation. We expect that some applicants will have some prior GIS experience, but this is not a requirement for admission. The course has a strong applied emphasis and draws upon the extensive expertise of teaching staff in the Departments of Geography and Urban Studies and Planning. This means that in addition to developing strong analytical and technical skills using GIS software, you'll be immersed in the practical applications of GIS and its potential to solve real world problems. Graduates go on to work for organisations such as the Office for National Statistics, Ordnance Survey, ESRI, the civil service and local government. The course will equip you with knowledge and skills to pursue doctoral research in GIS or spatial analysis. The MSc Applied GIS programme is structured in a way that maximises the development of skills and knowledge throughout the course of the 12 month programme. The first semester focuses on core skills and knowledge acquisition, whereas the second semester focuses on the development of more advanced skills. The Dissertation provides students with the opportunity to put their knowledge into practice in a relevant area of their own choosing. Assessments methods on this course will vary per module but can involve group work, presentations, individual reports or essays and portfolios or a combination of the aforementioned. This module represents a wide-ranging overview of the field of GIS in relation to data, visualisation and fundamental principles of GIS. Topics covered include combining attribute and geographic data, thematic mapping, mapping densities and proportions, geographical scale and classifying areas, social and spatial inequalities, micro-simulation and working with map layouts and presentations. Assessment is through a combination of lab worksheets and a GIS project. This module develops core quantitative competencies which underpin many of the methods used in contemporary spatial analysis. Topics covered include descriptive statistics, categorical data analysis, multivariate regression, logistic regression and factor analysis. Assessment in this module is through five equally weighted worksheets to be completed throughout the semester. This module focuses on the GIS and spatial analysis methods now widely used in professional settings, from urban planning and architecture to health care and social research. It focuses on helping students understand the potential applications of GIS in helping identify and tackle policy problems in the real world. The module is taught through a combination of case study based lectures and seminars. Assessment is through a 3,000 word written report. This module focuses on data handling and analysis and on developing analysis and visualisation skills using open source software (QGIS). Students will learn through a combination of computer workshops and lectures and be exposed to the latest developments in the field. Assessment is by means of a visualisation and data analysis project. This module serves as the pre-cursor to the MSc Applied GIS Dissertation and provides students with the opportunity to put together a comprehensive, focused research plan for their dissertation project, which accounts for one third of the total credits on the MSc. Students are guided through the process by expert tutors during the course of the semester. Assessment is by means of a final proposal at the end of the semester. This module builds upon the GIS expertise students develop during the first semester by putting into practice some more advanced technical operations in relation to real-world data and policy problem scenarios. Advanced spatial analysis and network analysis with ArcGIS take up much of this module, which is taught through a series of inter-related computer workshops. Assessment is through a multiple choice exam and an advanced methods report. This is a project-based module which aims to set students a real-world professional GIS project for an external client using a variety of different spatial datasets and GIS methods. The aim of the module is to prepare students for professional practice in GIS and spatial analysis through a group-work approach which places emphasis on collaboration, team working and objective-setting. The module is assessed through a combination of an interim report, final report and group presentation. One module from available unrestricted modules offered by Geography or Urban Studies and Planning (15 credits). The final semester focuses on the development of specialist knowledge and high level research skills. It involves the completion of a the MSc Applied GIS Dissertation. All applications are treated individually. For UK students, the usual entry requirement is a 2:1 degree or evidence of equivalent achievement (for example, a professional qualification combined with work experience). Applications are also welcomed from candidates with a 2:2 degree, although evidence of work experience or other activity is generally expected. For international students, we would expect you to be educated to degree level, or to have evidence of equivalent achievement, including work in professional practice. The programme is suitable for those from a wide range of backgrounds, including but not restricted to subject areas such as architecture, geography, urban studies, planning, economics, construction, law or other similar subjects, as well as non-cognate disciplines such as history, sciences and politics, for example. The Department is committed to a policy of equality of opportunity in the application process and wishes to ensure a diversity of students on its courses. It therefore particularly welcomes applications from people from non-standard academic backgrounds, from people with relevant employment experience, from minority ethnic students, from women, from mature students and from disabled students. Our approach to postgraduate study places a strong emphasis on the development of skills and techniques which will be useful in the world of professional work and practice. Therefore, the MSc in Applied GIS involves the development of expertise in a wide range GIS competencies. GIS professionals enter a range of diverse and fast-changing careers from managers, co-ordinators and specialists to programmers, analysts and technicians – all realising the potential of GIS to meet the needs of their chosen career. Our teaching staff work in the Departments of Urban Studies and Planning and Geography and have excellent contacts with employers across a range of relevant industries, including GIS, planning, surveying, academia, local and national government, and a wide range of other private sector employers. The Department also has a dedicated Placements Manager, Amy Woolley. Maximising the employability of graduates is a core aim of the MSc. Graduates from this programme will typically go on to work for organisations such as the Office for National Statistics, Ordnance Survey, ESRI, the civil service and local government. The course will also equip you with the knowledge and skills to pursue a PhD in GIS or spatial analysis. The ability to effectively manage, analyse and visualise large spatial datasets is now a key requirement for GIS professionals and you will be taught by staff with expertise in these specialisms. From this perspective, our focus is on helping you develop the skills you need to be able to effectively communicate the core messages of the data you are working with, in meaningful, high-impact ways. The following images are just an example of the kinds of outputs students completing the course could expect to produce. People on the move - resident population vs daytime population. North vs South - the English indices of Deprivation. London's 100 most deprived areas. 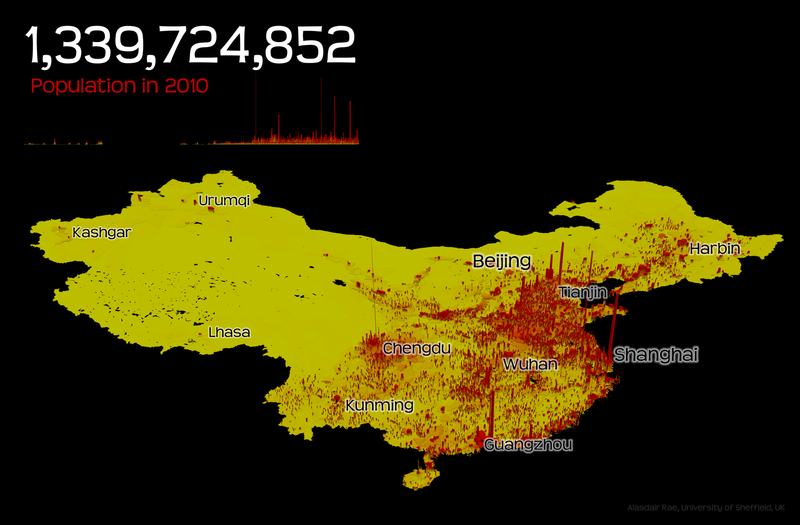 3D population raster-based density map – produced to demonstrate the spatial distribution of population in China (click the image for the larger version). 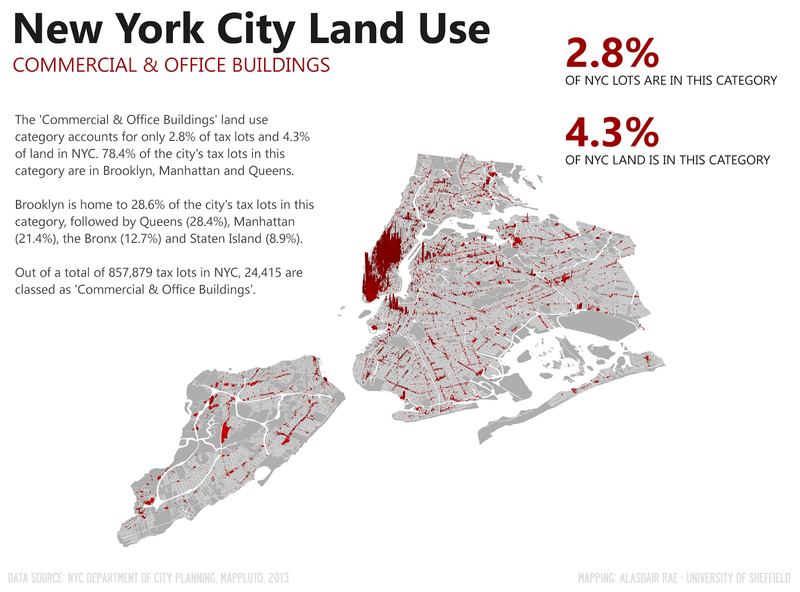 This map of land use in New York City builds upon the release of that city’s excellent MapPLUTO GIS open data. Similar datasets are now available for a host of cities worldwide (click the image for the larger version). Sometimes it’s easier to tell a simple story with a map. 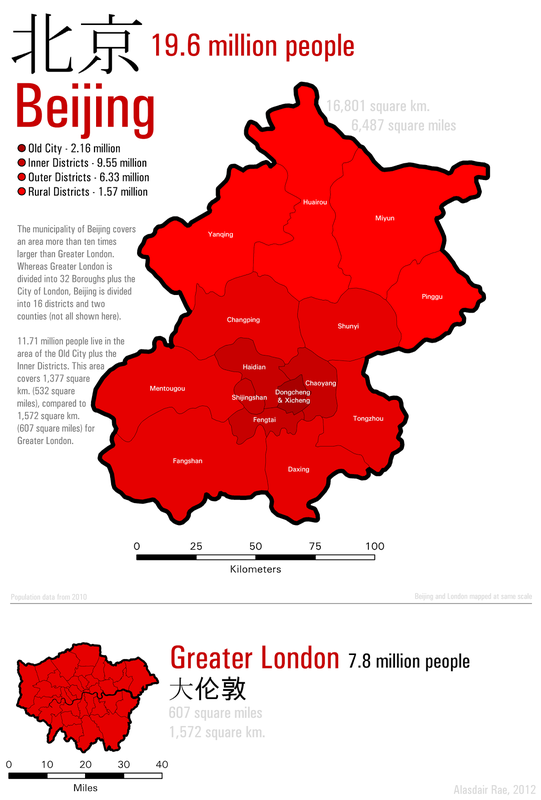 This examples shows the different sizes of Beijing and London, mapped to the same scale (click the image for the larger version). Flow map example – this shows global airline flows for the whole world. Similar output s can be produced for any kind of origin-destination data, including migration and commuting data (click the image for the larger version). All students on the MSc in Applied GIS programme will have the opportunity to win the prestigious, long-standing Ian Masser Prize for the best dissertation in the field of information management. The prize was established in 1998 by Emeritus Professor F I Masser on his retirement from the University after 19 years as Professor of Town and Regional Planning. Educated in geography and town planning at Liverpool University Professor Ian Masser received his PhD in 1975 and was awarded a LittD in 1993 by the same University. From 1986-1991 he was national coordinator of United Kingdom Economic and Social Research Council’s Regional Research Laboratory Initiative and he co-directed the European Science Foundation’s GISDATA scientific programme from 1992 to 1997. He was Founder President of the Association of GI Laboratories in Europe from 1998-9, President of the European Umbrella Organisation for GI from 1999-2003 and President of the Global Spatial DataI Infrastructure Association from 2002-4. His publications include eighteen books and more than 300 contributions to refereed journals, edited books and conference proceedings. The most recent of his books, ‘Building European SDIs’ was published by ESRI Press in June 2007. A second edition of this book containing material on developments since the approval of the ground breaking INSPIRE Directive was published in July 2010 and a third edition which will also describe its implementation in the national member states will be published in spring 2015. "The course was really interesting and engaging. My dissertation was the culmination of all the skills I had learnt, which gave me the confidence I needed to begin my career as a GIS research analyst."